Navajo Nation Presidential candidate Joe Shirley Jr announces his vice-presidential candidate Dineh Benally at a press conference on Tuesday, Sept. 2, 2014, in Window Rock. Dineh is the son of former Navajo Nation Presidential candidate, Donald Benally. Former Navajo Nation President Joe Shirley Jr. went for youth in picking his vice presidential candidate Tuesday. Dineh Benally, son of presidential candidate Donald Benally, is 37 with a master's degree in civil engineering. Shirley said he originally started with 31 suggestions and whittled that down to six and then three. Shirley admitted that he was looking for a young candidate because the Navajo voters indicated in the primary that they wanted a young candidate who would promote change. "We listened and we heard," said Shirley. 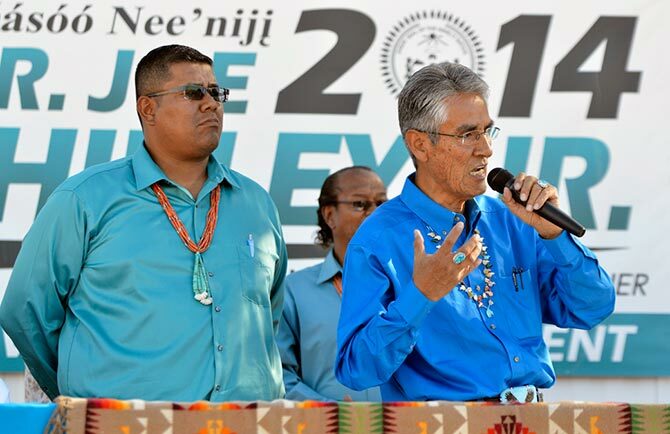 The vice presidential candidate is well known in the Eastern Agency, said his father, as well as in the western portion of the reservation for his work with the Navajo Generating Station. Dineh Benally said he has worked building schools on the reservation and helped get the funding to build the justice centers in Tuba City and Crowpoint. Another thing he brings to the campaign, he said is loyalty to his running mate. "I am ready to game on the challenge," he said.